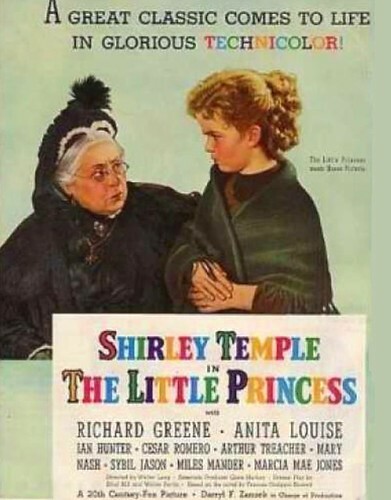 The Film: Shirley Temple goes from riches to rags in The Little Princess. The Stars: Shirley Temple, Richard Greene, Anita Louise, Arthur Treacher and Mary Nash. Source Material: The children's novel, A Little Princess, by Frances Hodgson Burnett. Little Sara Crewe (Shirley Temple) pines for her father in The Little Princess (1939). The Plot: Sara Crewe (Shirley Temple), the pampered daughter of a British military officer, is sent to an exclusive boarding school while her father goes to South Africa to fight in the Boer War. Sara is given every luxury until her father is reported missing. Sara can no longer pay the expensive tuition so the greedy headmistress (Mary Nash) forces her to work as a servant. Queen Victoria makes an appearance in a magazine ad for The Little Princess (1939). 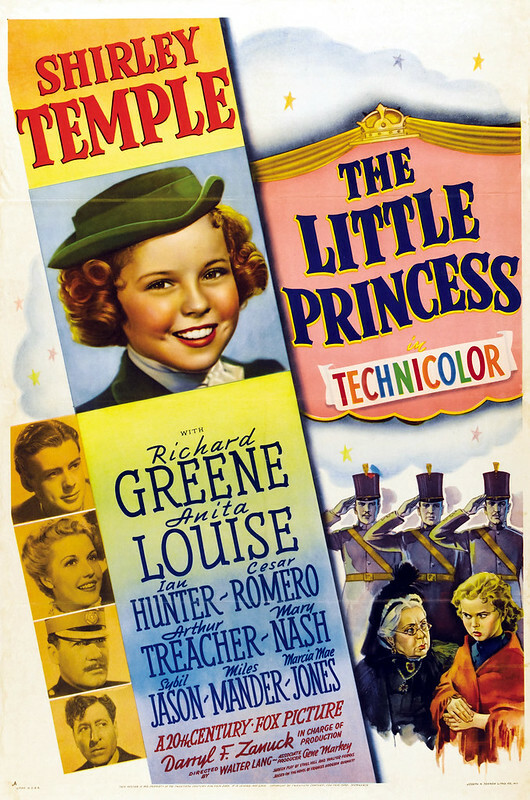 Backstory: Temple was the biggest star in the world throughout much of the 1930s, but by 1939 her box-office appeal had diminished somewhat as she grew older (she was 10 during the filming of The Little Princess). Shirley already had success with films of children's classics, such as Heidi (1937) and Rebecca of Sunnybrook Farm (1938), so Fox chief Darryl Zanuck approved a lavish adaptation of Burnett's 1905 classic. Best Performance: Arthur Treacher as "Bubbling" Bertie Minchin. Music hall legend Treacher plays the bullied brother of the headmistress who was forced to give up his stage career to become the elocution teacher at her school. Treacher has a great natural warmth that earns him the audience's sympathy, even when he is dressed up in ridiculous striped tights while playing a court jester. He also has great rapport with Temple -- he appeared with her in Curly Top (1935) and Heidi -- and their musical numbers are the highlight of the film. Best scene: Temple and Treacher singing and dancing to the old music hall number, "Knocked 'em in the Old Kent Road." 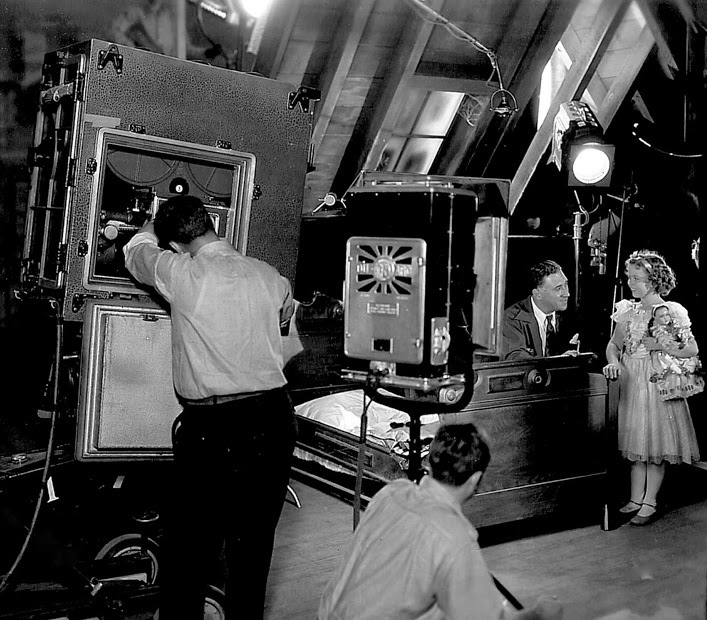 Director Walter Lang gives Shirley Temple some pointers during the filming of The Little Princess (1939). Best Line: "I prefer the less painful horrors of the battlefield." "Bubbling" Bertie explaining to his sister why he'd rather enlist in the army than stay with her. Period detail: The Little Princess was very loosely adapted from the source material (among the many changes was shifting the time period from the 1870s to 1899), but Fox executives were sticklers that the Victorian setting be recreated as authentically as possible. Everything was made to exact specifications, including all of the costumes. One of Temple's costumes had snap fasteners and when it was discovered that fasteners weren't invented until 1908, production was stopped until new garments were made. Dream sequence: The seven-minute dream sequence was the brainchild of Zanuck, who lavished $300,000 on that sequence alone (the entire film cost $1 million, making it the most expensive Temple film ever made). Temple was given two weeks of rigorous ballet training, but (as you can see in the clip above), she still needed help, so a troupe of trained ballerinas was brought in to dance around her. 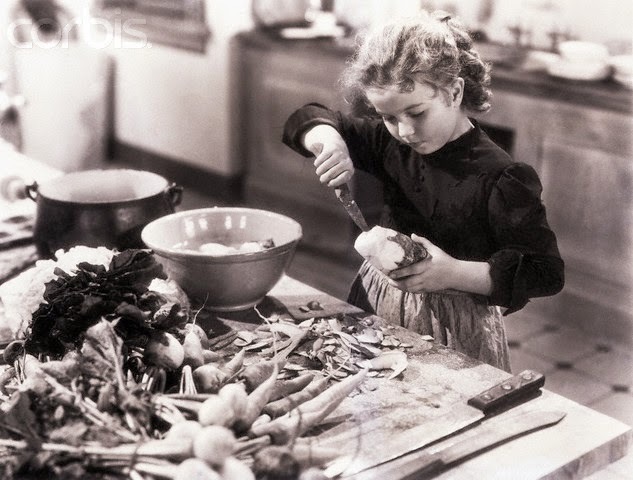 Poor Sara Crewe (Shirley Temple) is forced to peel potatoes in The Little Princess (1939). Fun Fact: Kindly Indian servant Ram Dass (Cesar Romero) was originally supposed to have a pet monkey, but that animal took an instant dislike to Temple and tried to bite her. The monkey was replaced by a parrot and the shooting continued without incident. Why it's essential: The Little Princess is a thoroughly enjoyable family film. Temple gives one of her best performances and the rest of the cast put in fine work as well. Director Walter Lang has a deft touch with the material. The film can be schmaltzy at times, but the last 30 minutes are extremely suspenseful and exciting as Sara's search for her father becomes more and more desperate. Availability: The Little Princess is streaming on Amazon Prime and Hulu. It is also available on DVD. Next week, we'll take a Christmas break. The essentials will be back on Dec. 29 with Babes in Arms.